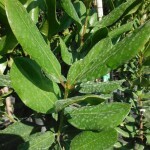 Allspice (Pimenta dioica) and Bay Rum (Pimenta racemosa) - Richard Lyons Nursery, Inc. The genus Pimenta comprises 14 flowering species, among which are a some of the most interesting and desirable aromatic trees in the world. But it’s all a mistake . . . a big mistake. 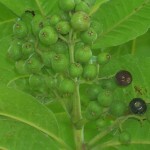 Spanish explorers poking around Mexico in the 16th century found an attractive medium-sized tree whose berry-like fruits resembled black pepper, so they called it pimienta, the Spanish word for pepper. That error has become preserved in the genus name. We concentrate below on two of the most significant representatives of Pimenta. 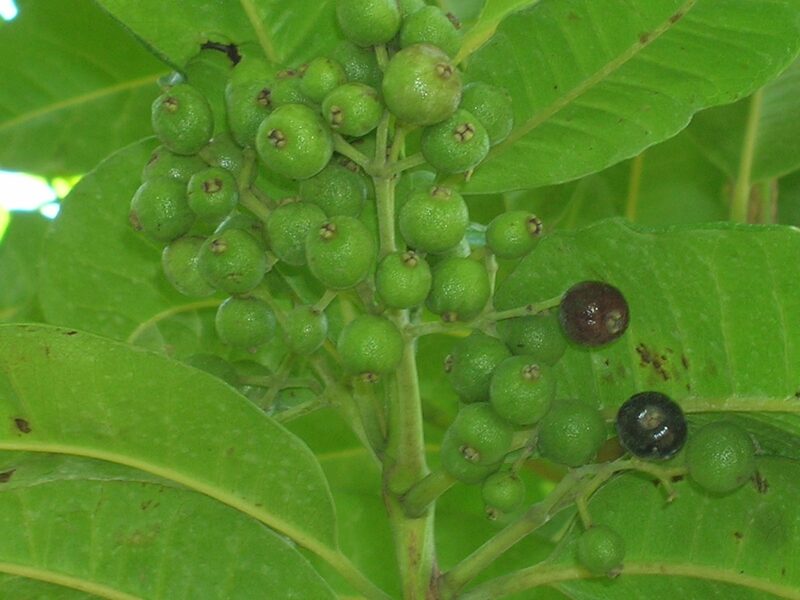 Pimenta dioica, the specific plant mistaken for a new source of black pepper, is better-known to most people as the allspice tree or, in another long-perpetuated error, the Jamaican pepper. The name allspice was bestowed on it by the English around 1621 because they considered its complex taste a combination of clove, cinnamon and nutmeg. The first recorded instance of the importation of the spice into Europe came in 1601. 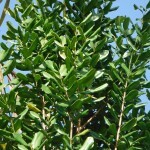 This beautiful tree reaches 30-40 ft. high and features aromatic, leathery, glossy, oblong 4-8 in. leaves. The bark, whitish-gray in color, peels away in thin sheets. The tree produces clusters of white flowers which are followed by berry-shaped fruits that mature purple-black. 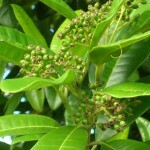 However, in the commercial production of allspice, the fruit is picked green and dried in the sun. The major volatile oil responsible for this species’ fame is eugenol. 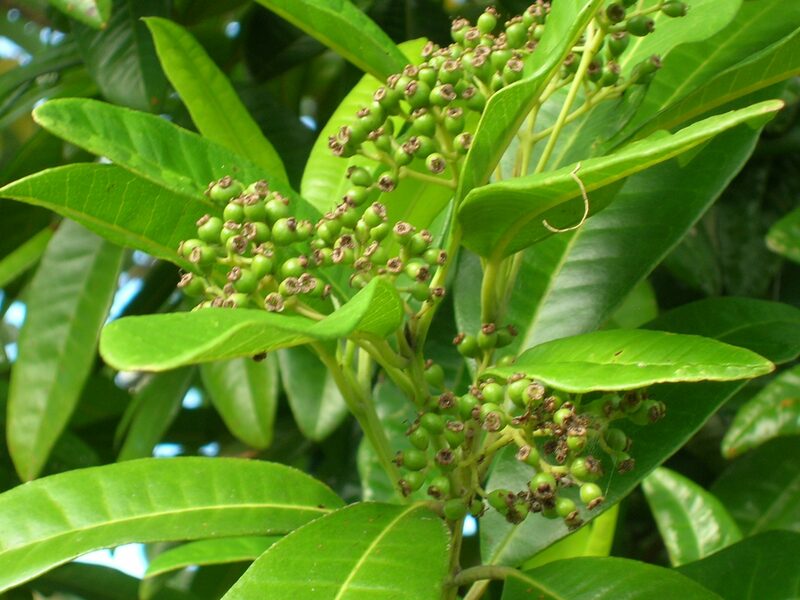 The allspice tree is native to the Greater Antilles (Jamaica, Hispaniola, Puerto Rico and Cuba), southern Mexico and Central America. 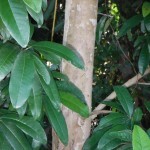 While the tree is now cultivated in many tropical areas of the world, it is apparently the only spice processed commercially solely in the New World, particularly Mexico, Honduras, Jamaica, Trinidad and Cuba. 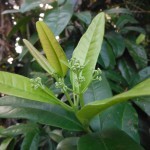 Jamaica was the leading exporter of allspice, at least until the 1990s, but there is now some indication that Mexico has superseded it, and Honduras and Guatemala are becoming major exporters. 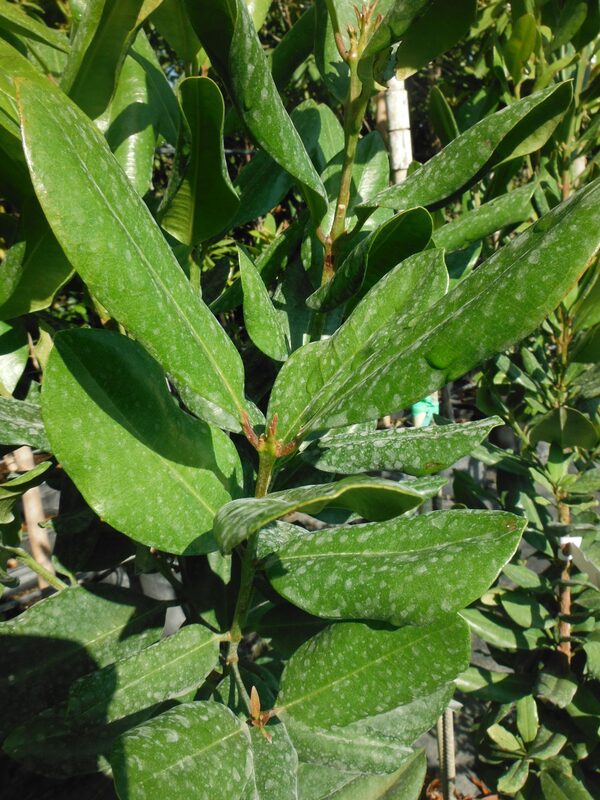 Once P. dioica is established, it withstands drought and even has some cold tolerance — 26-28°. It can be grown nicely as a container specimen, as well as in the ground, and performs best in full sun. 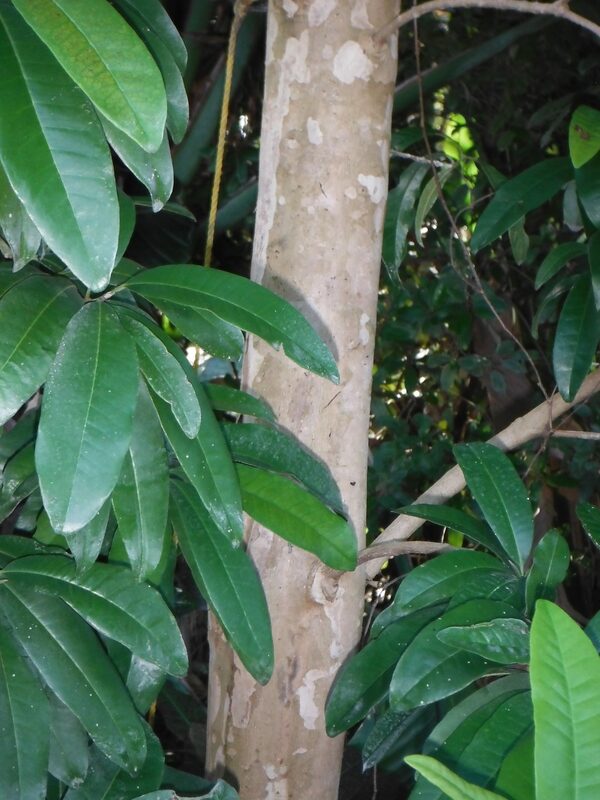 While the allspice tree may not flower and fruit dependably outside native areas, it is still quite desirable; even the bark is aromatic! Most folks know that the spice is used in a variety of condiments, and also in pies, cakes and candies. But eugenol is also an important constituent of cosmetics and perfumes. And it may surprise some to learn that allspice is even found in the liqueurs Benedictine and Chartreuse, as well as in Northern European food staples such as pickled fish and sausages. Eugenol also has medicinal applications as an aid to digestion and an anesthetic for toothaches. This would appear to suggest that the pies, cakes and candies which contain allspice must also cure toothaches. Could there be a more perfect food? 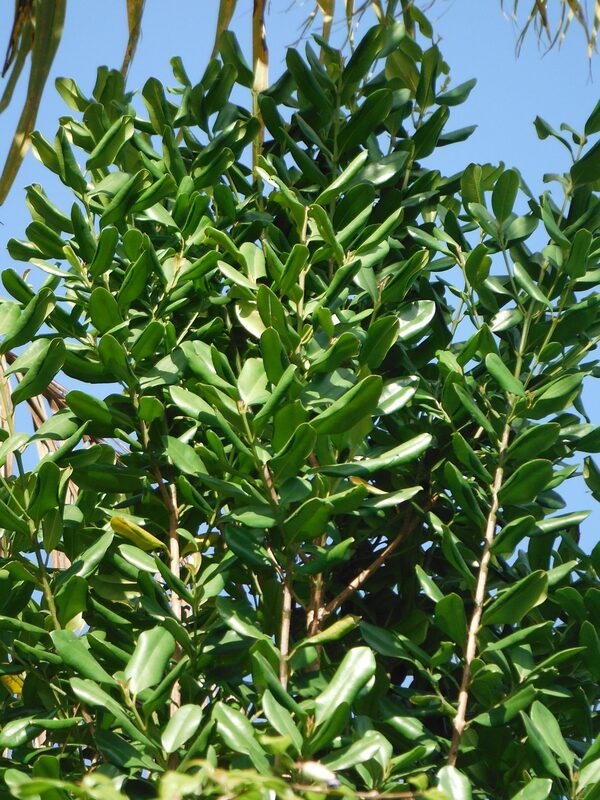 The second tree, Pimenta racemosa, better-known as Bay Rum or West Indian Bay Tree, is variable in height, maturing in the 12-40 ft. range, but generally shorter than P. dioica. It is native to the West Indies and possibly northern South America. The tree bears attractive, small white flowers which give way to black ovoid fruits. 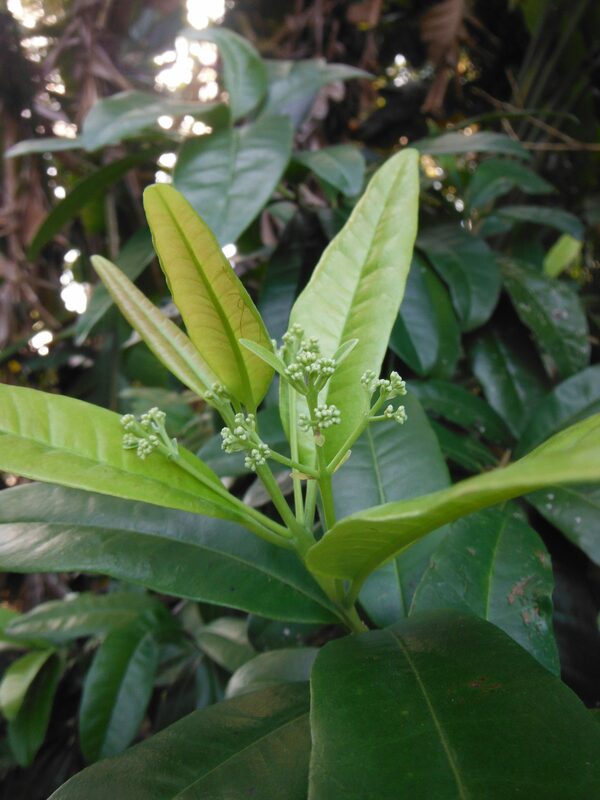 This species has about the same cultural requirements as the allspice tree, but is several degrees less cold-hardy. Bay rum is distilled from the berry-like fruits of P. racemosa, but this essential oil is not used in beverages because in that concentration ingestion is toxic. Instead, it is used as a constituent of colognes, perfumes and soaps. On the other hand, the leaves of this species are fine for consumption as a syrup or herbal tea, or in cooking. Leaves are sold fresh or dried. Medicinally, bay rum has long been employed to treat sore muscles and various strains and sprains. Scientists later discovered that the essential bay oil contains a constituent possessing anti-bacterial properties. And even more recently, at least one study has characterized bay oil as a potent antioxidant. Richard Lyons’ Nursery sells both species of these desirable Pimentas in 3-gal. and 15-gal. containers.